For one thing, the setting distinguishes Captain America from other superhero movies (except for Johnston's own precursor, The Rocketeer) in look and feel. There is a tinge of art deco in this film's production design, a hint of the optimistic futurism that could only be appreciated in a time when Americans were embroiled in the so-called "Good War." It is this golden, gleaming design quality—propagated by industrialist Howard Stark (Iron Man's dad, played by Dominic Cooper) at the film's World Expo—that is perverted by the evil Johann Schmidt(Hugo Weaving) into a steely, antiseptic aesthetic in the engineering of his own weapons. Once Hitler's pet, Schmidt was exiled into obscurity—the dark science division called HYDRA—by his Führer after forcing Dr. Abraham Erskine (Stanley Tucci) to give him an early version of a super-soldier serum. The serum enhances the subject's inner self. 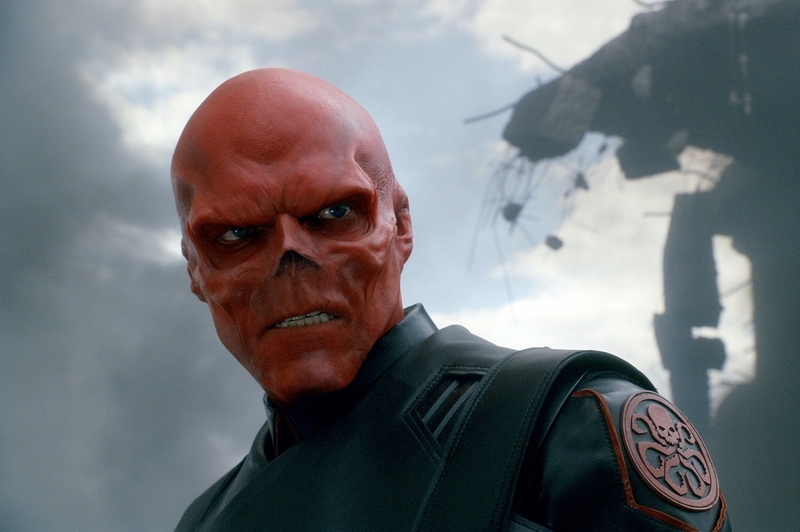 In the case of Schmidt, an officer whose ambitions to subjugate the world include overthrowing Hitler, the Red Skull is what emerged. Dr. Erskine defects to America, and retaliates against the bullying Nazis by offering his services to Col. Chester Phillips (Tommy Lee Jones) and the U.S. Army's Project Rebirth. 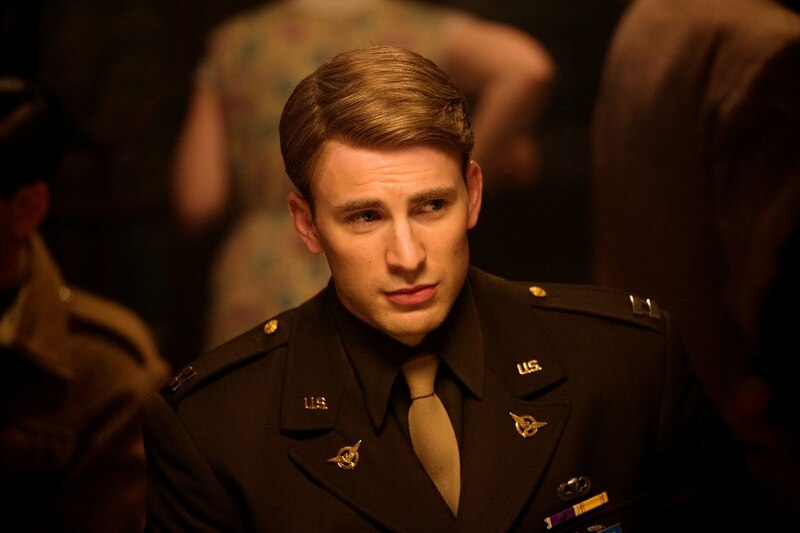 Erskine convinces the colonel and his assistant, Agent Peggy Carter (Hayley Atwell), that 90-pound asthmatic Steve Rogers (Chris Evans) is the ideal subject for the experiment because of his innate decency. In impressive counterpoint to the deformed Red Skull, Rogers' ironic metamorphosis is into that of the six-foot tall, muscular representation of the very superman Hitler always fantasized about. 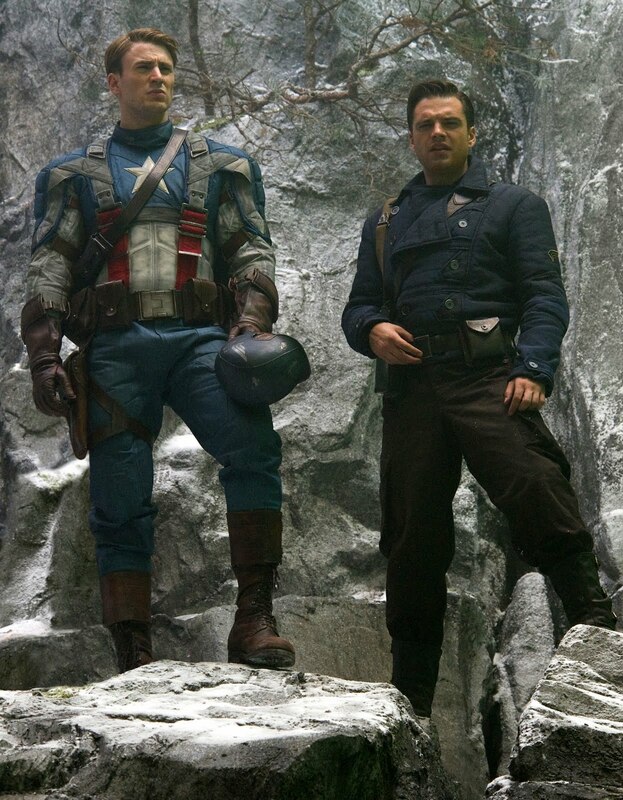 After a few false starts Rogers eventually takes up the mantle of Captain America, fighting the Axis in the European theater of the war. Director Johnston (The Wolfman) never succumbs to the temptation other filmmakers do when confronted with an iconic comic book hero. Rather than dwell on too many explanations behind the hero's origin or wasting time on demonstrating his fabulous powers on feats of strength, Captain America shows us these things in ways organic to its central story. Forced to chase a Nazi spy down Brooklyn streets shortly after Rogers has been transformed, we see his abilities in action: his speed and agility as he bears down on his quarry through oncoming traffic; his strength as he lifts the man out of his seat in a mini-submarine and onto the dock. Johnston evokes the spirited joyride feel of his mentor's Raiders of the Lost Ark without being slavish to it (the way J.J. Abrams was in this summer's Super 8). After a villain throws a child he held hostage into some deep water to distract the heroic Rogers, the kid cracks wise, "Go get him. I can swim." At any point, one gets the feeling sweet Captain America could turn a corner and run smack into smartass Indiana Jones. That putting such a corpse-obliterating weapon in the hands of everyday Nazi soldiers would have been something of a Holocaust game changer is one of a number of potentially rich parallel-historical details that the film doesn’t care to grapple with. But isn't this the very fiction critic Jonathan Rosenbaum railed against, at this site and others, when discussing Inglourious Basterds—a form of Hollywood revisionism that would cheapen both the film and the horrific historical event by its very shallowness. Expecting the Capraesque Steven Rogers to deal with an issue of such mournful gravity would be like forcing Jimmy Stewart to address the effect his filibuster will have on unemployment should he succeed at shooting down the Public Works bill being debated in Mr. Smith Goes to Washington. Johnston pays homage to the types of old-fashioned films which inspired Americans during the War. Atwell's Agent Carter, is a voloptuous, quipping tough broad reminiscent of actress Ginger Rogers. Tommy Lee Jones's Col. Phillips probably chews more nails for breakfast than John Wayne ever did. Our hero, Steve Rogers, is the figurative country bumpkin right out of Capra's films, his naivete and innocence so endemic, he has no choice but to do good and set an example on the grander world stage. Months ago, I made a comparison between Thor's unknown lead, Chris Hemsworth, and another actor who made his name when he first played a superhero, Christopher Reeve. I spoke too soon. Evans's performance is so devoid of its usual sarcasm which has brought on unfair comparisons to the smirky Ryan Reynolds (Green Lantern), so hip-to-be-square in its aw-shucks-ness, that its earnestness is endearing. In this era of fractured politics, Captain America: The First Avenger is a much appreciated tonic in the superhero film genre, offering us a charismatic lead with virtually no trace of cynicism or darkness that Americans of all stripes can rally around, one who actually exemplifies Abraham Lincoln's "better angels of our nature." I"m definitely seeing this... and soon. Johnson seems the perfect director to take on this origin story. Fine review, Tony. Thanks. Just returned from the theater. 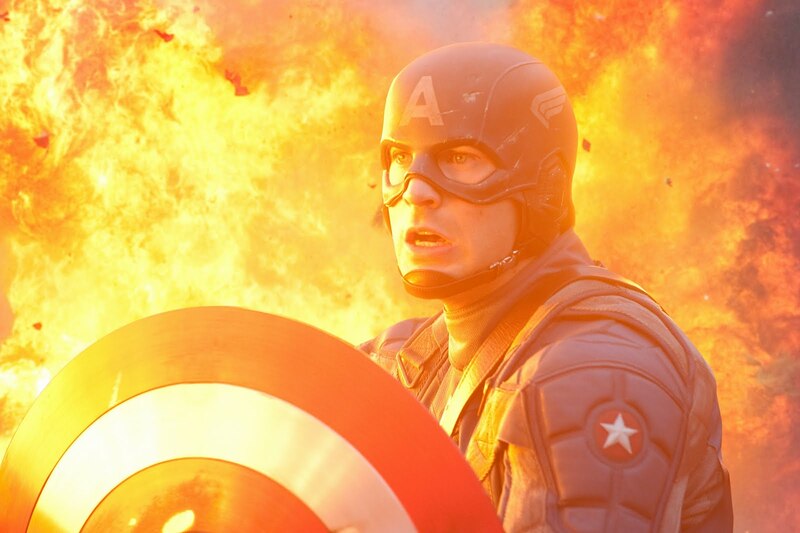 Thought they did a great job with Cap. One of the best comic book to film adaptions I have seen. (Even though I wasn't a fan of the comic, I enjoyed the appearance of the Howling Commandos.) 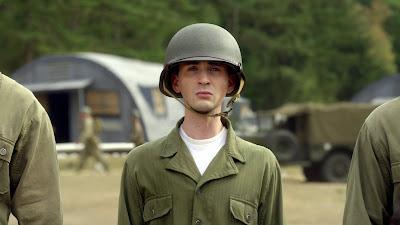 I know Cap is going to appear next in The Avengers movie, but I would love a sequel showing him adapting to modern life, finding out what became of his past friends, etc. Not sure how they would keep future films in the WW2 era as you suggest, altho I suppose there could have been missions and adventures in there that we didn't see. Regardless, great fun movie. Glad you liked it, Chris. I'm sure Cap's adjustment to present day is in the cards. That Marvel brand of angst is built into the modern version's DNA. Since I posted the review early, I didn't want to spoil anything, so (SPOILER WARNING) I didn't discuss the film's structure in too much detail. But you alluded to this in your comment. There are enough gaps in the storyline (particularly in the montages) that one could imagine numerous adventures in the WWII era that haven't been depicted yet (I'm hoping for a run-in with Baron Zemo). While I doubt they would set any subsequent films completely in the WWII era, indications are that the filmmakers are aiming more for a HIGHLANDER type structure in which dual storylines in the past and present frequently intersect due to a common theme or plot point.